Do you remember the first time you built an RPG character? It was exciting and full of possibility, and your imagination ran wild. If you’re an avid gamer, it was probably a major milestone for you. But do you also remember struggling to decipher an empty character sheet, and what you were supposed to write down in each box? Remember poring through the core rulebook, cross-referencing one table with a class write-up, the spell book with your chosen school of magic, and skills to your race? Whether you thought it was fun or perplexing, or both all at once if you play RPGs, the process of building and tracking a character is probably something as natural to you now as using a computer. That’s an appropriate analogy, because in fact, as we all know, character sheets have themselves been computerized. It’s a sensible match; computers are great for tracking information that changes frequently. They certainly handle it a lot better than scratches on paper worn thin by repeated erasing and scribbling and more erasing. When I was working in the film industry at Weta Digital, I formed an after-hours gaming group. We wanted computerized character sheets that ran on our workstations. We looked into building custom spreadsheets in Libre Office until we found PCGen, a Java-based application that makes character creation and maintenance sublimely simple without taking the fun out of either. It’s free, it’s open source, and it’s completely cross-platform. If you use your computer to manage your character, you owe it to yourself to look at PCGen. While it doesn’t have a mobile version, there is a PCGen viewer for Android, so you can access your build whenever you need to refer to it. PCGen is a Java application, so it runs on anything that has Java installed. This isn’t quite the same thing as Java in your web browser; PCGen is a downloadable application that runs locally on your computer. It’s likely that you already have Java installed, but if not then download and install it from java.net. If you’re not sure whether you have it installed or not, you can download PCGen first, try to run it, and install Java only if it fails to run. PCGen is downloadable from pcgen.org. It offers downloads from two mirror sites; I strongly suggest using the Github host, since Sourceforge, unfortunately, has been known to insert adware into its downloads without consent from the publisher. Thanks to the infamous “Satanic panic”, I was forbidden from playing RPGs as a child, but nobody ever said anything about building characters for the game. As a result, many hours of my childhood were spent poring over my friends’ D&D Player Handbooks and rolling up characters I’d never play. In short, the character build process is very precious to me as an adult player. A new player might think they want an application to do a build for them, but most experienced players probably agree that the best way to learn is by doing. If an application is nothing more than a pregen factory, then it’s one of the most important parts of being a player is removed from the game, and nobody really wants that. On the other hand, nobody wants the character build process to discourage new players. Well, PCGen manages to strike a perfect balance between guiding you through a character build and staying out of your way as you tinker. Primarily, it does this by using an unobtrusive alert system that keeps you updated about any required tasks left in your character build. It’s helpful without grabbing the steering wheel out of your hands to take over completely. PCGen has, essentially, two modes: the character build and the character sheet. When you launch it, you’re first asked to choose what game system you’re building for. Included systems are OGL (Open Game License) systems, including D&D 5e, 3 and 3.5 editions, Pathfinder, and Fantasy Craft. Better still, PCGen comes preloaded with all manner of add-on material, so not only can you design characters from advanced and third-party modules, the DM can even create stats for monsters and villains. Once you’ve double-clicked the system you’re using, you’re presented with a helpful screen letting you either load an existing build you have saved or start building a new one. When you start a new character, it gets its own tab in PCGen, so if you want to build a whole party or if a DM wants to track a whole hoard of monsters, it’s easy to load up a cast of characters and have them at the ready. 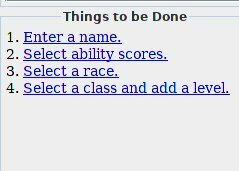 Starting from the top left, your character build starts with the basics: choosing a name, gender, and alignment. PCGen includes a random name generator with lots of knobs and switches to adjust for etymology (real and fantasy), race, and gender. When it’s time to roll for ability scores, PCGen has lots of options. It defaults to manual entry. You roll physical dice and enter the numbers. Alternately, you can let PCGen roll for you, and you can set the rolling style. You can have PCGen roll 4 d6 and drop the lowest, roll 3d6, or roll 2 d6 and add 6. You can also choose to use a point purchasing mode, with a budget of anything between 15 to 25. This method might appeal to players coming from video games, many of which use this method to alot attributes. Once you pick a class and add your first level, your attributes are locked in and a budget is provided to you for all remaining class- and level-dependent aspects of your character. What exactly those are, of course, depends on what system you’re playing, but PCGen keeps you updated on any remaining required tasks as you go. There are a lot of tabs in PCGen, and it can sometimes seem just as overwhelming as staring at a physical 300 page Player’s Handbook, but as long as you follow the tips, PCGen can keep you on the straight and narrow. As if building your character wasn’t enough fun, the mostly satisfying step is yet to come: seeing all of your choices laid out in a proper character sheet format. The final tab of PCGen is the Character Sheet tab, and it formats your character’s attributes into a layout of your choosing. The default layout is a pretty standard, generic layout. It’s easily printable and easy to understand. There are several variations and addendums available, too. For spellcasters, there’s a spellbook sheet that lists available spells, and there are several alternate layouts, some optimized for screen and others for print. If you’re using PCGen as you play, you can add temporary effects to your character sheet to let PCGen adjust your attributes accordingly. 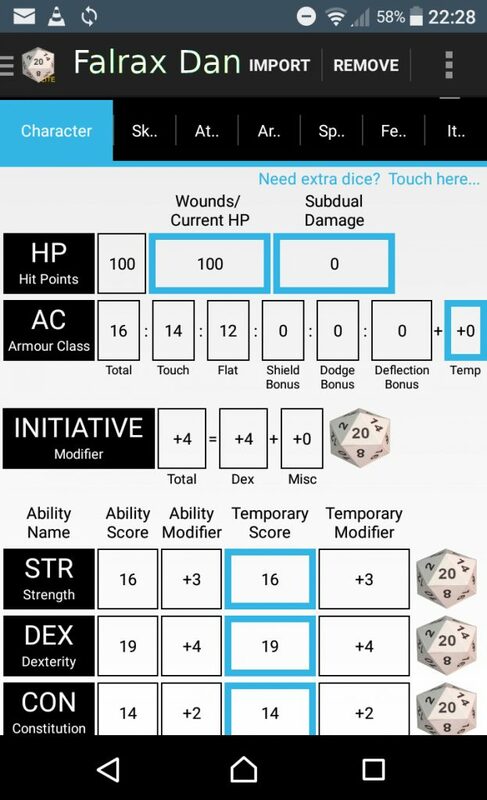 If you export your character and import it into the PCGen Importer on your Android phone or tablet, you can use your digital character sheet to track spells, current health, and to make temporary adjustments to AC and other attribute modifiers. The market’s full of digital character sheet trackers, but PCGen stands out for several reasons. First of all, it’s cross-platform. That may or may not mean much to you personally because as individuals we tend to standardize our own workflow to devices that play nice with one another. In my gaming groups, though, we have Linux users and Windows users, and we have people who want to work off a mobile device and others who prefer a proper computer. Choosing an application that everyone can use and become comfortable with just makes the process of updating stats more efficient. PCGen being open source is invaluable, too, because all of your character data remains in an open and parsable format. As an avowed fan of XML, getting my character data as an XML dump is invaluable to me, and doubly useful to me as a DM as I prepare for an upcoming adventure and need custom monster stat blocks to insert into my notes. The assurance that PCGen will always be available regardless of financial circumstance is also nice. When I changed jobs a year ago, I was lucky enough to go from one job to the next without interruption in income. In one of my gaming groups, however, two members have been made redundant recently and a third is a university student without much disposable income. The fact that we don’t have to worry about monthly membership fees or whether we can all afford to invest in software that is, at the end of the day, a minor convenience over pen and paper, gives us confidence in our choice of using digital tools. Since PCGen is open source, it also lends itself to rapid development and expansion and ensured maintenance. The reason there’s a mobile edition at all is because the code and data is open. Who knows what’s next? While PCGen’s default datasets revolve, naturally, around OGL content (because the OGL is open and allows content to be freely redistributed), since the application is also open, you can add whatever data you want. It’s not necessarily trivial, but games like Open Legend, Dungeon Delvers, and other openly-licensed games are ripe for porting to PCGen. The tradition of pen-and-paper is important. PCGen strikes a healthy balance between the desire to make stat accounting more convenient by leveraging the latest technology while maintaining the joy of manually updating characters. Whether you’re an old-school gamer who banishes digital devices from your table or a progressive gamer who embraces technology, it’s fair to say that most of us have probably encountered a few times when a game has come to a halt because of a phone or tablet. The fact is, everyone has a mobile device now (even me, even if it’s only because my job pays for it), so they’re going to make their way onto your game table. I have found that encouraging game-relevant information to be on the screens has helped focus players on the game; I’d rather my players stare at their character sheets and game reference documents than surf social media sites. PCGen, in my experience, is the most true-to-form digital character sheet available. It allows for user control, it offers useful guidance as needed, and it’s as close to pen-and-paper convenience as possible. Take a look at it, open gamers!